K7 Computing is proud to announce the release of version 2.0 of K7 Enterprise Security and K7 Enterprise Antivirus. The latest version implements new functions and improved performance for its already great performing antivirus engine for endpoint protection..
Products are reflecting the need for new security features and enhanced protection tools for business and organisation networks. Products are focusing on easy implementation and management capabilities while maintaining low system footprint that products from K7 are known for. K7 Enterprise Security and K7 Enterprise Antivirus version 2.0 are available immediately for download. Current client’s installations will be upgraded automatically via regular updates within upcoming weeks. 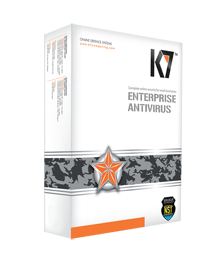 K7 Computing is pleased to announce the product release of K7 Enterprise Antivirus. K7 Enterprise Antivirus complements existing K7 Enterprise Endpoint security software for business K7 Enterprise Security and K7 Mail Security for Microsoft Exchange. K7 Enterprise Antivirus offers endpoint protection built on the award winning K7 Antivirus engine with the best performance by AV Comparatives for 2010 and 2011, and features protection for endpoint computers and servers for SMBs and Enterprise clients with a built in Web Management console providing administrators with easy access to Endpoint management via any web browser. – Drive-by-download blocking: detects and block zero-day browser exploits and rogue AV downloads. Single web console for endpoints and server control and management. Enterprise Antivirus has active directory support for endpoints installation offering multiple ways to install endpoint protection remotely. Provides email notifications and easy access to security events reporting. Console allowing admins to trigger events on the clients, group clients and assign policies, restrict USB and external media access and overview the network security status. Business antivirus with easy implementation, and the lowest system resources used to protect endpoint, that’s K7 Enterprise Antivirus. Secure your free 30 day trial at www.k7computing.ie, or contact any approved K7 reseller for further information.